A return is a statement which is filed by the taxpayer as per the law with the tax administrative authorities. GST return can be filed both online as well as offline. Under this new tax reform, a registered taxpayer shall file GST return at GST common portal. 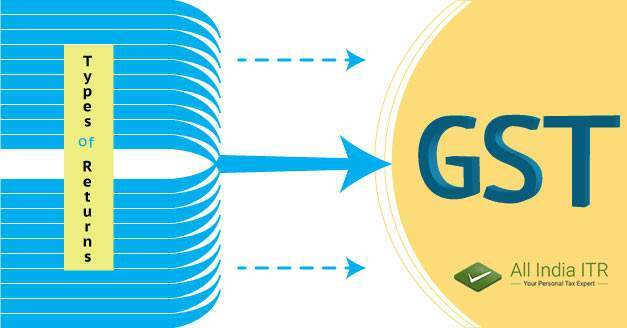 There is common e-return for Central Goods and Service Tax (CGST), State Goods and Service Tax (SGST), Integrated Goods and service Tax (IGST) and Additional tax. Under this reform, a normal individual is required to furnish three monthly returns and one annual return. 1) GSTR-1 is filed by the registered taxable person. It includes details of all outward supplies of goods and services during the month which have been submitted. Due date for filing this return is 10th of the subsequent month. 2. GSTR-2 is filed by the registered taxable recipient which includes the details of all input supplies and details about claiming tax credit by 15th of the subsequent month. 3. GSTR-3 is filed by a registered taxable person in which the details regarding the monthly return on the basis of finalization of outward and input supplies along with the amount of Tax payable is included. There is a common mode for filing all these returns. These monthly returns are filed by a portal managed by the Goods and Service Network (GSTN). Monthly returns are filed by Regular Foreign Non-Residents and casual taxpayers, whereas quarterly returns are filed by the composite taxpayers. Annual return is filed by 31st December of every next financial year. Who needs to file for it? Registered Taxable supplier. Due date for filing return Form – 10th of the subsequent month. What has to be filed? Aspects of all outward supplies of goods and services during the month. Who needs to file for it? Registered Taxable Recipient. Due date for filing return Form – 15th of the subsequent month. What has to be filed? Details of all input supplies of goods and services effected during the month and claiming the tax credit. Who needs to file for it? Registered Taxable Person. Due date for filing return Form – 20th of the subsequent month. What has to be filed? Monthly return on the basis of finalization of the outward and inward supplies along with the amount of tax payable. Who needs to file for it? Composition supplier. Due date for filing return Form – 18th of the next succeeding quarter. What has to be filed? Quarterly return for compounding Taxpayers. Who needs to file for it? Non-Resident taxable person. What has to be filed? In this return has to be filed for a Non-Resident Foreign taxable person. Who needs to file for it? Input service Distributor. Due date for filing return Form – 13th of the subsequent month. What has to be filed? The return has to be filed for input service distributor. Who needs to file for it? Tax Deductor. What has to be filed? Return for the authorities who deduct tax at source. Who needs to file for it? Tax Collector. What has to be filed? Details of the amount of tax collected. Due date for filing return Form – 31st December of the next financial year. What has to be filed? Annual Return. Who needs to file for it? A taxable person whose registration has been canceled. Due date for filing return Form – Within 3 months of the cancellation date or date of cancellation order, whichever is later. What has to be filed? Final Return. Who needs to file for it? An individual having Unique Identification Number (UIN) and claiming a refund. Due date for filing return Form – 28 of the month, following the month in which the ITR has been filed. What has to be filed? Details regarding inward supplies need to be furnished by a person having Unique Identification Number (UIN). Who is required to file a return under GST? a) Every registered dealer under Goods and Service Tax (GST) is required to file a return. A return needs to be filed despite any sale or purchase activity has been carried out during the return period. b) Government entities or Public-Sector Units (PSU’s) who don’t deal with GST supplies or persons exclusively dealing in exempted or non-GST Goods or Services are not required to file a return under GST. How many Returns for Composite Taxpayers? Composite Tax is a flat rate of tax which is payable on the turnover of the business in a specific period. It doesn’t take input credits for their purchases. Composite taxpayers are required to file GSTR-4, which is to be filed quarterly. In GST, taxes are getting simplified but the burden of compliances on businesses is increasing as they must file 37 returns (3 x 12 Monthly + 1 annual returns) in a year. a) Details of outward supplies. b) Interstate supplies (Both Interstate and Intrastate) from registered as well as unregistered dealers. c) If any change is to be made in inward supplies as per Form GSTR-4A. Includes: Details of the quarterly returns filed by the suppliers. Next articleHow can you save taxes through fixed deposits?